Bond was born on the 22 August 1833 in Knotty Ash, Liverpool. Baptised William Joseph, Julius Caesar seems to have been self-adopted. The number of letters in his name later caused him to be referred to humorously as ‘The Alphabet Painter’ or ‘Alphabet Bond'. The son of a Post Office clerk, Bond was educated at Stonyhurst, a Jesuit college in the Ribble Valley. He first trained as a picture restorer and was apprenticed to Thomas Griffiths in Caernarvon. In his own words he then began to ‘sketch a little out of doors’ and after some encouragement took up a career as a painter. He exhibited at the Liverpool Academy (1853-1867), became an associate in 1856 and was a member of the Liverpool Society of Watercolour Painters. He also exhibited at the British Institution and the Royal Academy. In 1860 he married Jane Douglas Bond, the daughter of a Caernarvon iron- monger. He lived and painted in Caernarvon for a period before returning to Liverpool in 1865. Initially inspired by the Pre-Raphaelites, Bond’s later work was greatly influenced by Turner and he became largely known as a marine and landscape painter. 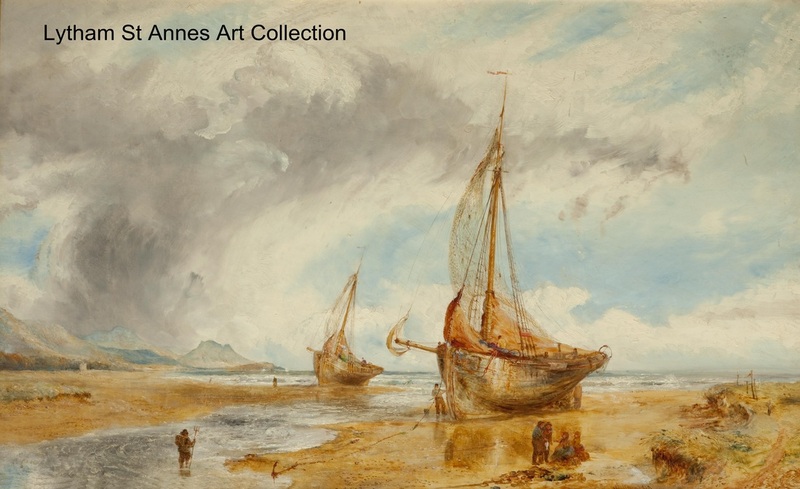 The nineteenth century was a very fertile period for marine painters, particularly in the major ports such as Liverpool, although Bond favoured fishing boats and coastal scenes rather than larger vessels or naval ships. ​There is also evidence that Bond worked in Holland. The Liverpool Mercury reviewed both View of Amsterdam (18 October 1882) and The Beach at Scheveningen, one of the districts of the Hague, (6 August 1883). Commenting on the latter, which had recently been donated to the Walker Art Gallery, Liverpool, it stated, 'In this picture Mr Bond challenges comparison with the Dutch masters of marine paintings, meets them on their own ground and measures no less'. Bond died on 29 March 1926 at Freshfield, Formby. Although painted six years apart, these two paintings are similar in style. Bond tended to use ‘a light bright palette over a white ground’ and intended that his paintings should mature with age. Small figures of fishermen can be discerned on board the boat in Returning from the Fishing Grounds and there are a number of people in the scene in Shore Scene with Trawlers, including one fisherman handing over a sample of the catch to one of two women sitting onshore on upturned baskets. Unlike painters from the Newlyn School, Bond did not seem interested in figural painting or depicting the lives of fishermen and their wives. His people are always in miniature, dwarfed by the magnitude of the landscape. Even his boats, though detailed and accurate, are secondary to the vast skies, swirling clouds and tumultuous seas. Like Turner, his paintings have an abstract, impressionistic quality, focusing on the dramatic possibilities of the elements. The setting for these two works is unknown but as he painted many scenes on the Wirral, Merseyside, this may be a likely location. Inscr: Signed (L.R.) and dated '99 Signed and inscribed on the reverse of the frame.